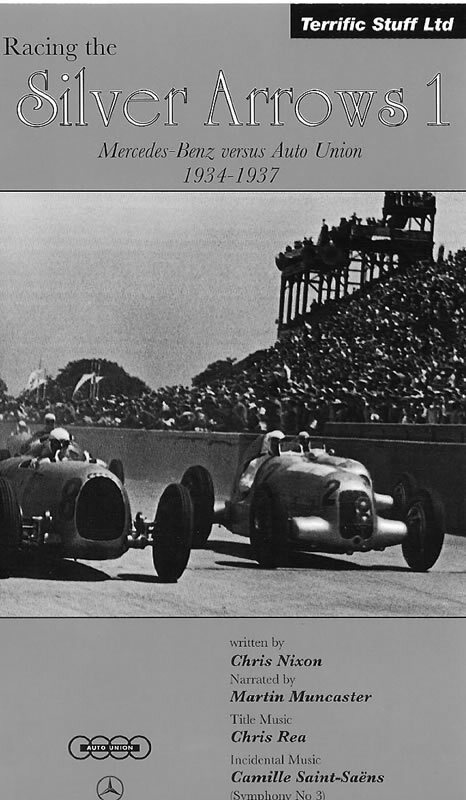 Racing The Silver Arrows tells - for the first time on video - the full, remarkable story of how the new company of Auto Union challenged the old established firm of Mercedes-Benz on the race tracks of the world between the years 1934 and 1939. With this original film from the Auto Union Archive, Terrific Stuff presents the legend of the Silver Arrows: Part 1 - the birth of Auto Union and Prof. Porsche’s mid-engined masterpiece; 1935 - Rudolf Caracciola is first European Champion, with Mercedes-Benz; 1936 - the sensational rise of Bernd Rosemeyer, who becomes Champion in only his second season of motor racing; 1937 - The Battle of the Titans: Mercedes win at Tripoli and Avus, Auto Union hit back in Eifel GP and Rosemeyer breaks records on the autobahn and then wins the Vanderbilt Cup; Caracciola wins the German GP but von Delius is killed; Hans Stuck wins the Mountain Championship for Auto Union at Freiburg. Please use the enquiry form to ask us about the postage and packing fees for books.